Hello ladies! It's been a while since my last nail polish related post, and I bet most of you are really missing these lately. Recently I've been featuring various beauty related posts on the blog and I hope that doesn't scare you off, I just want to expend the blog's content by sharing with my readers more things that I love. I promise I will do my best to post more of nail polish related content for you to enjoy! 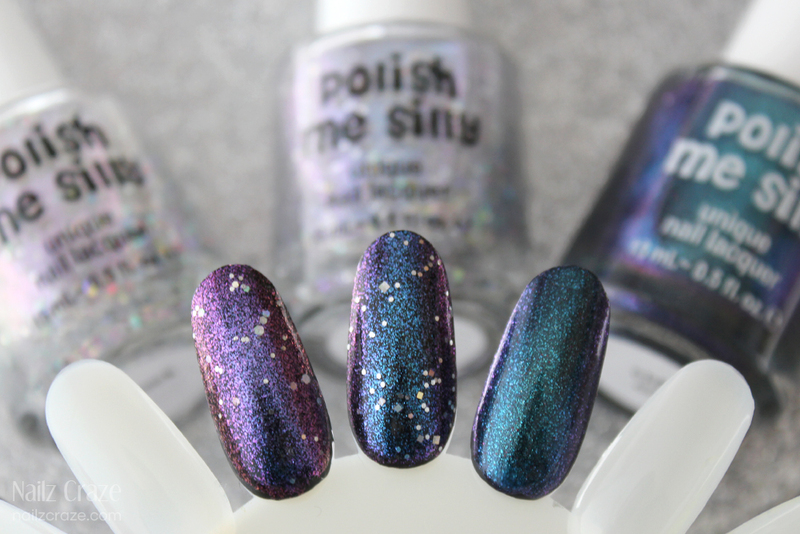 So today I have a quick swatch and review post featuring three awesome colors from Polish Me Silly. Hope you'll enjoy this post! 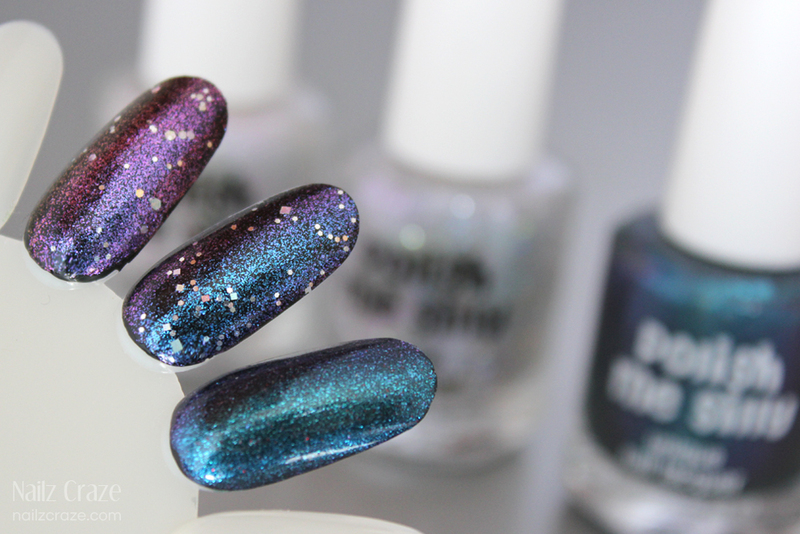 In the swatch photo above you can see one coat of Mind Blowing over a black base in direct sunlight. The multichrome effect doesn't show that well in the sun and it's more noticeable in the shade / indoors. This multichrome glittery trio was pretty hard for me to capture, and believe it or not, but I actually did three (!!!) swatch session with these, and always ended up being disappointed that my camera couldn't capture the true beauty of the color shifting. Multichromes can be tricky that way, and I am quite picky with my photos, so that should explain the lack of swatches on my actual nails. Instead, I managed to capture these colors on a swatch wheel and I think they show the effect of these glittery multichromes much better. The colors below are (L-R): Lovestruck, Mind Blowing & Chill Out. I applied one coat of each color over a black base. Lovestruck & Mind Blowing are best applied over a base coat since they have a clear base, but Chill Out can be layered alone to get the same color and effect as in bottle. 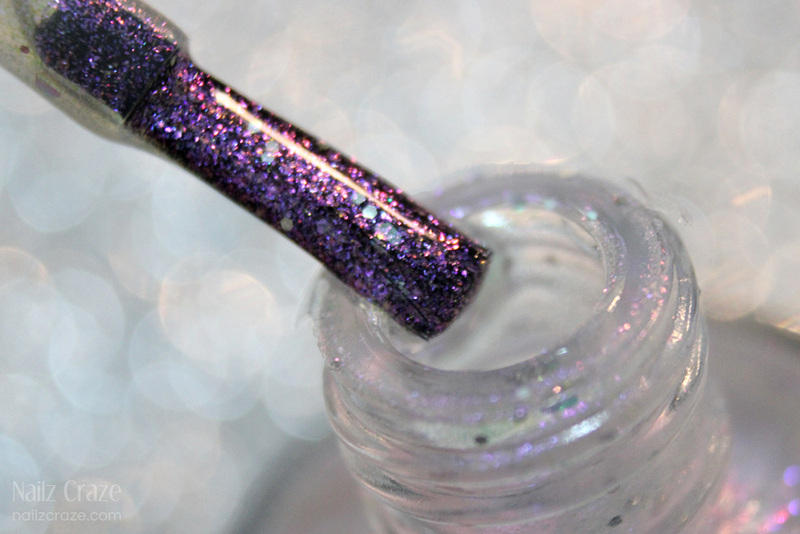 Lovestruck is a multichrome glitter topper that shifts from purples, to pinks, to red / gold with a high shimmery effect, it also contains holographic hex glitter in various sizes. The effect and color are best shown over a black base, but you can apply it over any color you choose to add it a gorgeous sparkly effect. Some of the larger glitter particles settled at the bottom and made it a bit difficult to pull out of the bottle, but a good shake before application pretty much solves this issue. 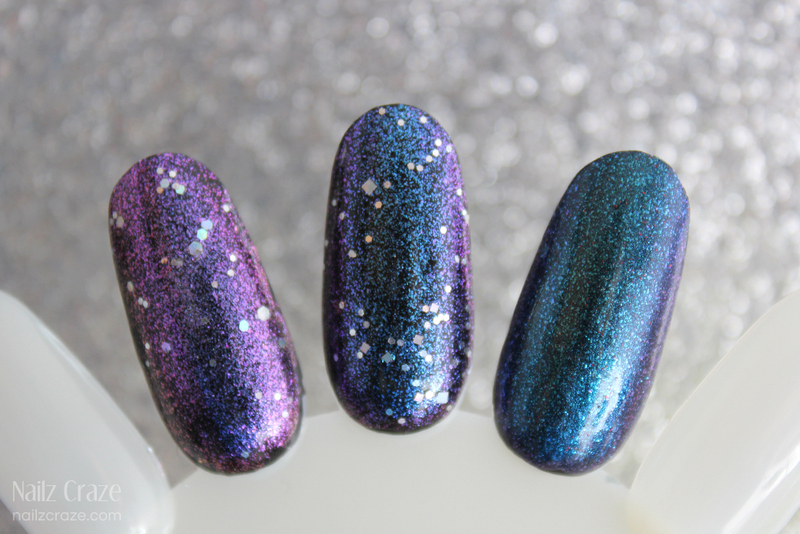 Mind Blowing is very similar to Lovestruck, it's a multichrome glitter topper that shifts from blues, to purple, to pinks with a high shimmery rainbow effect, it also contains holographic hex and square glitter in various sizes. 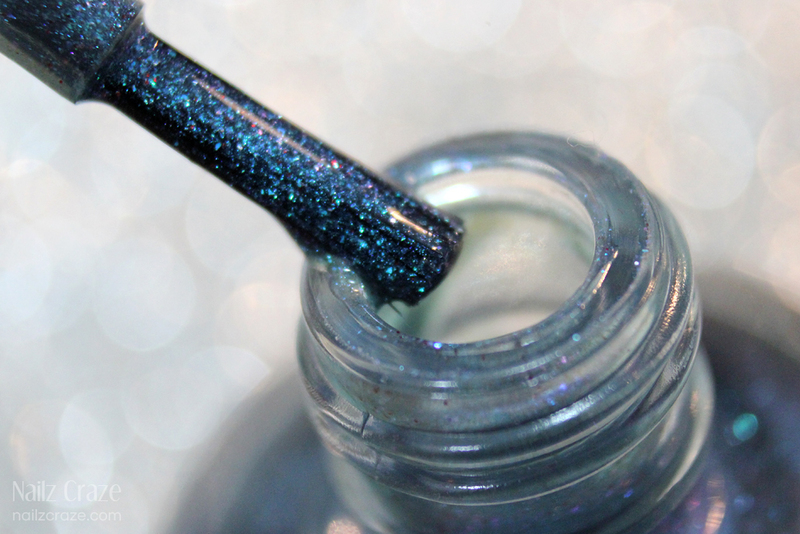 This one was my favorite out of the three, I really loved how the colors shift in this multichrome topper, and the glitter mixture in it was very interesting. purples, to green. It has a bit of tiny red glitter that makes this mixture even more interesting. This polish is very sheer on it's own and you will need about 2-3 thick coats to get it opaque, or apply over a black base to enhance the color and effect. 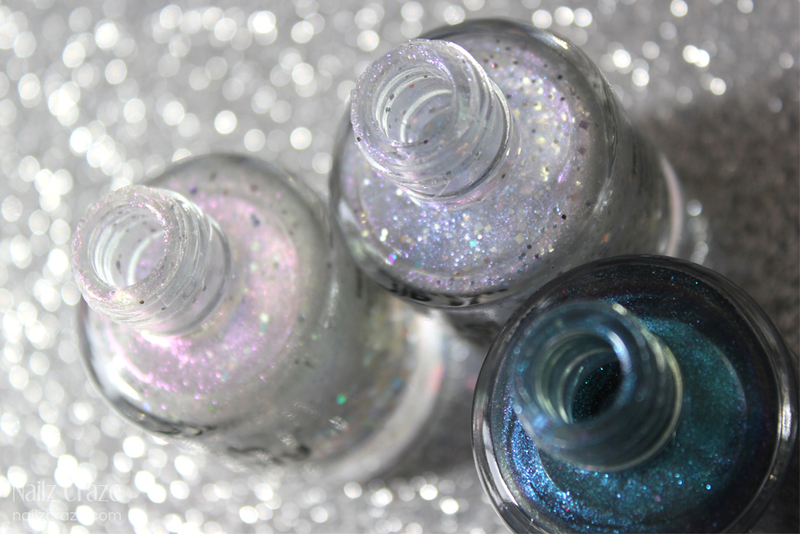 Lovestruck & Mind Blowing (Chill Out is currently out of stock) are available for purchase at the Polish Me Silly Etsy store in mini (9ml / $6.5) and full size (15ml / $10.5), worldwide shipping available. Also be sure to check Polish Me Silly social media links for more beautiful handmade nail polish from Karin & Lexi! 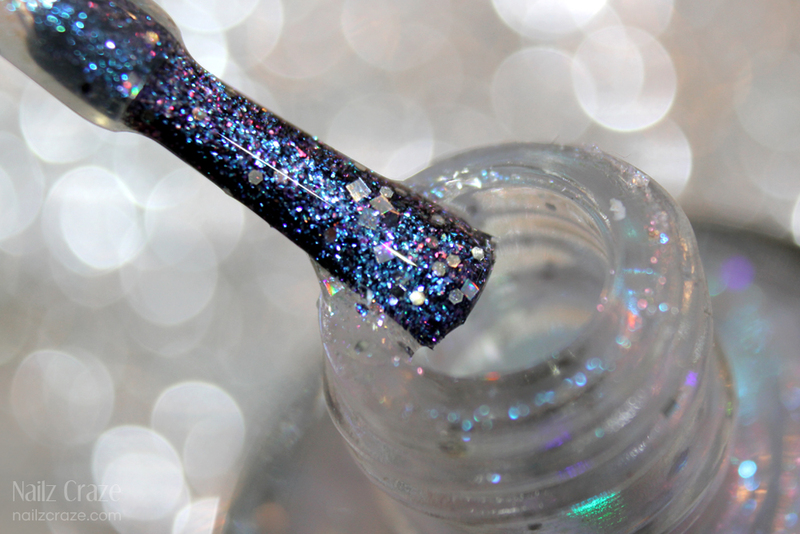 Gorgeous polishes and I love the pictures! ooh my these are gorgeous! !